The book comprises 27 chapters, preceded by a Preface, Foreword and a list of contributors. Each chapter is appended by a list of References. The main sources of producing bioenergy are the natural vegetation, industrial biomass, agricultural waste, food waste, animal waste, water-based biomass etc. Among the processes used from biomass to bioenergy conversion can be combustion, pyrolysis, gasification, conversion of biomass to liquid and gaseous fuels through chemical reduction, alcoholic fermentation or anaerobic digestion to produce biogas. Further the concept of Biorefinery has been introduced to produce products using environmentally favourable bio-based processes. Bioenergy has been considered as an important alternative source of energy to meet an ever-increasing demand for energy of the world. Moreover, bioenergy considered to be a sustainable and clean source of energy and reduces dependence on fossil fuels. For example, Ethanol can be used as a substitute for petrol in modified internal combustion engines or as a non-lead octane-enhancing gasoline additive. Besides, an alcohol powered automobile provides an advantage of using small engine and small cooling and exhaust system. Brazil and USA are two major producers of Ethanol produced from sugarcane waste. There are many processes or pathways of utilizing agricultural or food waste to produce energy. Another source of bioenergy is biodiesel, which can be produced from vegetable oil, animal fat or waste cooking oil. Food industry alone in Europe generates about 250 million tons /year of bye-products, waste and effluents which can be used as source of bioenergy. This book provides deep insight into a wide spectrum of bioenergy sources and processes that can be used to generate bioenergy. 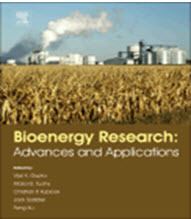 The book therefore can serve as the latest and a complete source material on bioenergy. The editors should be complimented for having done an excellent job of compilation of possible bioenergy sources, state-of-the-art developments involving 83 contributors around the world. The book can be highly indispensable source of information of what is being done currently in the realm of tapping bioenergy as an alternative source of energy along with its potential for use and its limitations and ways to overcome bottlenecks in biofuel and bioenergy processes.